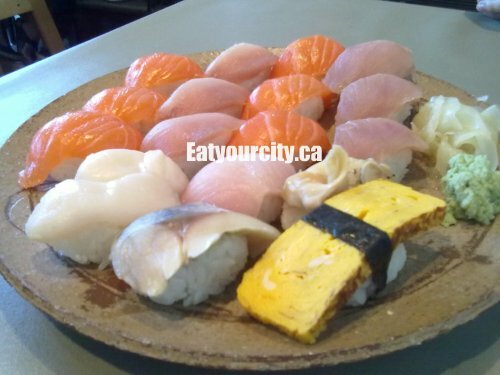 Eat Your City: Sushi Wasabi Edmonton AB - Great sushi and service.. lets eat.. Itadakimasu!! Sushi Wasabi Edmonton AB - Great sushi and service.. lets eat.. Itadakimasu!! 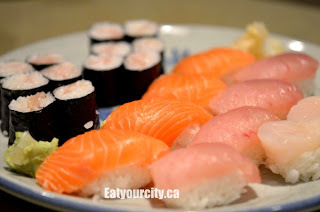 With our new camera in hand (this is one of the times we actually remember to bring it along) we head to our favourite Japanese family run sushi joint in town, and we're not disappointed. The place is a bustling despite our late arrival 20min to last call, and service is efficient despite being short one waitstaff and we notice the kitchen is short the chef's daughter, who is usually seen expertly cutting sashimi, or dashing back and forth between tables and the kitchen. We sit back and enjoy some fragrant green tea with roasted puffed rice as Japanese murmurs intermingle with the background noise of patrons chatting in the small and cozy restaurant, with the family occasionally calling out "Arigatou Goziamasu" or "Sank-you!" to customers leaving the restaurant. We start off with a small bowl of wakame salad. 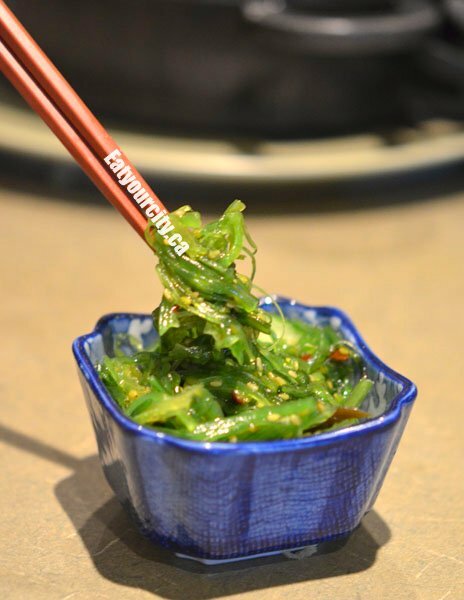 Wakame is a type of seaweed - with a crisp, crunchy and non-slimey texture. Its a rich verdant green as they use fresh green wakame seaweed to make this dish with a few strands of red seaweed mixed in. Some places you'll notice their wakame salad is a bit darker khaki in color, as that's due to the use of dried wakame seaweed rather than fresh. The salad is crisp, tangy and oh so addicitive with their secret slightly sweet sesame oil and rice vinegar based dressing its marinated in. 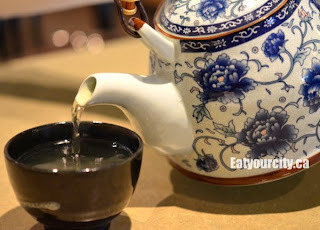 The roasted sesame seeds its laced with adds in a wonderful nuttiness. Little bits of chili gives it a touch of heat. I can eat an entire mixing bowl of this salad, its so good... but you get a small portion in a bowl garnished with some sliced cucumbers. Our next appetizer is the sunomono salad - medium rice vermincelli noodles swimming in a tangy rice vinegar vinegrette topped with slices of blanched octopus sashimi, chunks of imitation crabmeat, a fan of sliced cucumbers, parboiled sweet shrimp, a clump of chopped kelp and garnished with a twist of lemon. Their tangy-sweet vinegrette makes this salad... it lends all the toppings you dunk into it a bit of acidity and yumminess.. once you start this cool and refreshing salad, you can't stop until the bowl is finished. 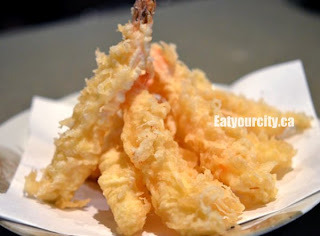 We head into tempura land with a platter of shrimp tempura - the lightly battered shrimp is crispy and cooked to perfection as the shrimp inside is moist, succulent and sweet, while the tempura is a light golden crunchy crisp goodness. 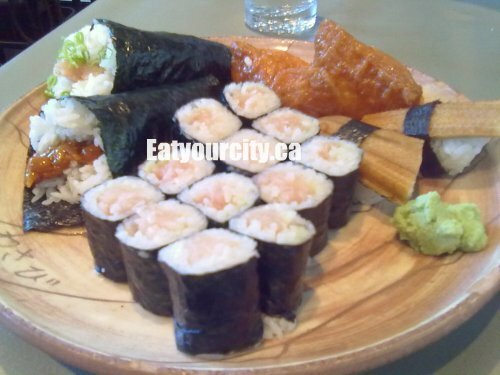 Great to munch on alone, or dunked in their house made ginger laced ponzu dipping sauce. They usually toss in an extra piece of sweet yam or broccoli tempura hiding at the tempura mountain bottom so you get some vegetables in (they are a family run restaurant)... nom! Now for the sushi nigiri! Our two orders of tekkamaki - small bite sized tuna rolls are cut with precision. 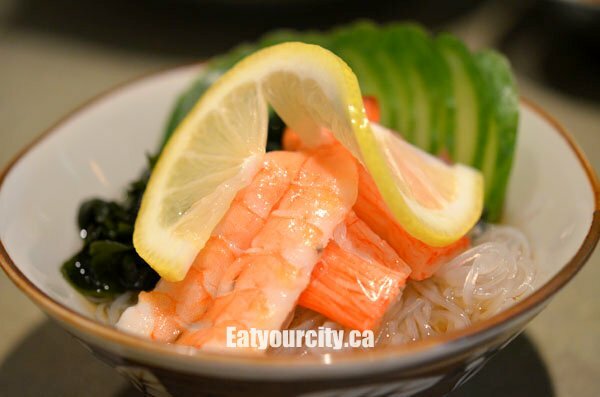 The sushi rice is well seasoned, with a hit of tanginess from the rice vinegar, the rice isn't too sticky nor dry, and each individual grain of rice while visible, still maintains its pressed form when you transfer from the plate to your mouth. The tuna is fresh with the tasty slightly sweet-salty flavor you only get from well executed sashimi. Nommy nom nom! 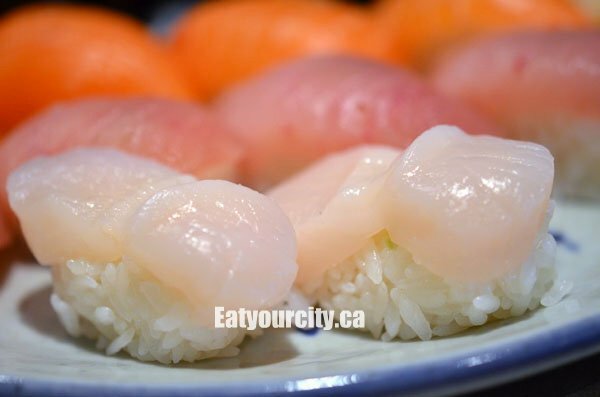 The scallop sushi nigiri is next, with large fresh sweet raw scallops that yield with a slight spring in your mouth (no mushy scallops or 1/4 scallops here! You get fresh and an entire large scallop on your nigiri!) crowning again the well seasoned and expertly formed sushi rice. Mmmmm. 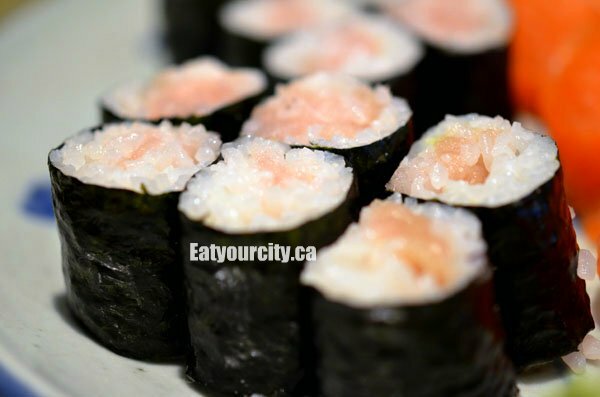 If you want to have these, they are available only at the restaurant, as the sushi chefs believe they won't taste as good as they languish in your car as you transport them home, so it is not available on their take-out menu. No sushi night is complete for us without some sake nigiri (salmon) and maguro nigiri (tuna) to round out our sushi cravings. The salmon was rich, fatty, well marbled with a subtle sweetness lent from the seasoned rice. The tuna was nice and fresh - no trace of fishiness and oh so deliciously creamy. You can have your nigiri made with no freshly grated wasabi root - we always let the chef go nuts - he'll freshly grate then adds in a generous swipe of wasabi sandwiched between the sashimi and the rice. Be warned - the freshly grated wasabi is a bit different than the commercial horseradish paste at other establishments... its deceptively initially a bit sweet and fluffy, followed by a more pungent tear-jerking/eye-watering/nose searing burn. Its like hot sauce... put just enough and it'll add to the experience... too much and you'll be hurting to breath LOL! We also had (more) salmon and tuna nigiri - nicely lined up in a row, more scallop nigiri (you can never go wrong with more scallops!) and as well as a whelk nigiri (a bland and rubbery blanched shellfish- its the one right beside the egg nigiri), a fresh but characteristically strong tasting saba (mackeral) nigiri on this plate (beside the sweet layered egg nigiri). I took the next 2 pics with my camera phone (sorry for poor pic quality) so we could dig into the food faster rather than wait to use the nicer camera. ;More tekkamaki (small rolls with tuna) with the perfect ratio of fish to rice to nori is delectable, as is the savory bean curd nigiri (upper right). The unago nigiri (salt water eel) is moist and smokey and is simular to delicate smoked trout. We deviate a bit tonite and have cones... on the top left is a tuna and green onion cone, refreshing and light and we contrast it with the enoki mushroom cone. The enoki mushrooms are stewed/marinated in a rich caramelized sauce yeilding a cone that was both savory and sweet. Nom! 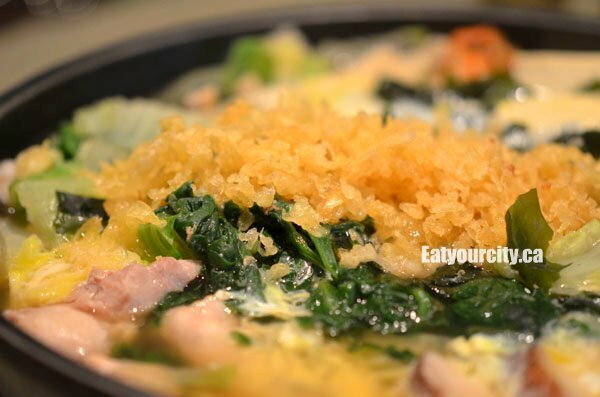 Finally, to round things out, and as its a rainy wet evening, we warm up with a homey, down to earth bowl of nebayaki udon. Soft udon noodles are swimming in a light broth inside a huge cast iron pot that keeps things warm long after your meal is done. Tonight, the nebayaki udon is topped with chunks of tender chicken, sweet shrimp, small pieces of black cod, two vegetable studded fishballs, tofu, suey choy, enoki mushrooms, chinese mushrooms, kelp, sliced carrots, diced green onions and topped with a poached egg and a handful of crispy tempura bits. Mmmmmmmmmmmm! Overall, yet another great meal from Sushi Wasabi, where you can always expect fresh seafood, expert nigiri skills, and a warm and welcoming atmosphere from this family run Japanese restaurant. Gochisousama deshita - Thanks for the feast!